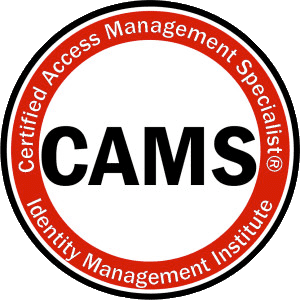 Thank you for taking the Certified Access Management Specialist (CAMS) practice exam. Professionals who have hands-on responsibility for managing access requests and ensuing that system access is appropriate within their organizations should consider the comprehensive CAMS training and certification to be recognized as an expert in the fastest growing segment of cyber security. These 10 practice questions should give you an idea about the final online exam which includes 100 similar multiple choice questions. Your test score and the correct answers to these questions will be e-mailed to you shortly after you submit the practice test. 1. What type of access control is currently most popular for businesses? 2. Why is security information and event management (SIEM) essential for data security? 3. What is one major reason why companies should conduct access audits? 4. What are the three pillars of the CIA triad? 5. What is an endpoint? 6. What are the consequences for companies failing to comply with security regulations? 7. On what three principles should access control be based? 8. The process allowing authenticated users to access specific information is called what? 9. What do the rows and columns in an access control matrix represent? 10. How is authentication best defined? Please enter your name, email address and press Submit Quiz. If you receive an error message, press Previous to go back and answer all questions. The results will appear after you submit.